From time to time I use the blog to look at some “grey market” stuff, usually from obscure issuers with a very bad risk/return relationship. Examples were Prokon, WGF or Solar Millenium. However, one should not forget that the established financial institutions are also “capable” to screw their clients over and over. Let’s, for example, look at a currently marketed “Aktienanleihe” from Deutsch Bank with the WKN DX2UZZ. The paper flyer comes with the slogan “Sichern Sie sich einen attraktiven Zinssatz” (meaning: secure your attractive yield right now) and a big 7% sticker. So this is clearly a case where the bank tries to sell a quite risky investment based on a coupon which looks attractive on a nominal basis. In sales speak this is sold as “Your coupon is secure plus you have a (30-40%) buffer before you loose money”. 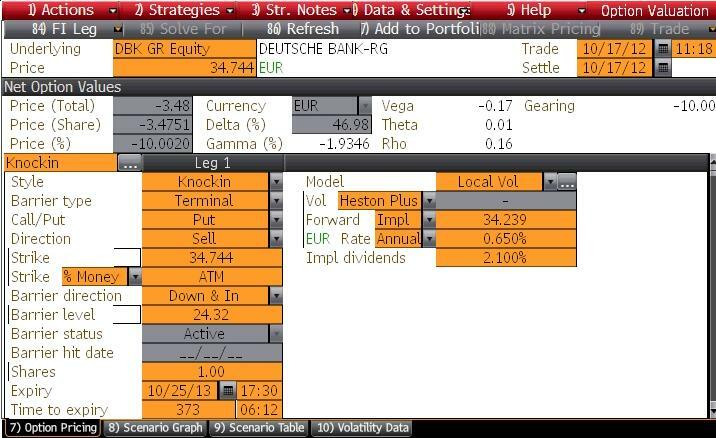 I do not know where the Deutsche Bank share price will be in one year’s time, but other than the Prokon and WGF securities, here the underlying is a traded security which means that the structured security can be modeled and valued. Analytically, in a first step one has to slice the security into the funded part, a 1 year Deutsch bank unsecured senior bond and the “structure”. We can easily find on Bloomberg the “fair price” for a 1 year Deutsche Bank Senior bond: Thats 0.65% for the Euribor plus 0.45% 1 year senior Deutsche spread. So a plain vanilla 1 year Deutsche Bond would yield 1,1%. “Short put with terminal knock-in feature”, meaning you, as buyer of the security are selling Deutsche Bank a put option on their own share. What we see is that the standard valuation tool says you should receive 10% (of nominal) if you are selling such an option. Add on the 1.1% for the “plain vanilla” bond, then the “fair” value of the coupon would be 11.1% not 7%. Why bother might some people say, 7% is better than 1% and the probability of the Deutsche Bank share going down so much is probably not so big. The problem is: Deutsch eBank takes out almost 40% of the “Fair value”. No one knows the probability, but there is a market for this kind of risk. Deutsch Bank can easily hedge their part and directly pocket the 4% at the moment when they sell this “beauty” to the German retail investor. Although they have to share their “harvest” with the distribution partners. For the “little investor” this is bad, because a large share of his “expected” return is taken out by the bank, which means simply on average he will loose money with this if he invests in such products. I don’t even want to mention all the other issues like “asynchron information” if the issuer of the security is also the issuer of the underlying. There are a couple of more possibilities to screw the investor because off this. This Deutsche bank “security” in my opinion represents everything which is wrong with the financial system. The banks still try to sell complicated stuff to investors who don’t understand it and cut out fat fees in order to make sure the little guy looses over time. In my opnion, the banks should have to disclose at least the “fair value” of such securiteis based on available standard models so that teh invetsor knows what amount Deutsche is earning upfront. The current disclosure would indicate that they only charge 1% addional issuing fee. However I guess I will not see in my lifetime that banks will offer “fair products” to little investors unless they are forced too. Maybe the little guys do have to share the blame by being too greedy (or desperate), but Deutsche Bank knows exactly what they are doing. Morgan Sindall ist one of the best scoring UK companies in my Boss Score screener, so I thought I might have a closer look into it. Morgan Sindall Group PLC operates a specialist construction group. The Group’s activities include office design, fitting out, refurbishment, building contracting, property investment, and related specialist services. Morgan Sindall operates in the United Kingdom and the Channel Islands. So the big question one has to solve with Morgan SIndal is: How do they manage to have such stable margins although they are so razor-thin ? “Classical” competitive theory would suggest that a company with 1-2% margins is in a very difficult situation from a competitive point of view. Morgan Sindal howver seems to be able to constantly earn those razor-thin margins and turns them into great ROEs with efficient capital management. The table clearly shows the discrepancy between “moat like” returns on assets and “distressed” profit margins. Over the last 20 years, Morgan Sindall was under the Top 20 performers of the UK small cap index, with an incredible performance of 15.4% p.a. vs. 4.6% for the UK all share index. I guess the low margins are also one of the reasons, why Morgan Sindall is not the darling of UK stock bloggers. Construction company Morgan Sindall (MGNS) report a “satisfactory first half”. It seems to consistently throw out about 75p EPS each year, and pays 42p in divis. So at 615p it looks fair value. I don’t like this type of company with huge turnover £2.2bn p.a., and wafer thin profit of around £40m p.a., as they are only one problem contract away from a profits warning & potentially insolvency. John Mc Elliot covered it a little in his Valueinquisition blog, but I think he didn’t buy and his blog is not very active anymore. There is also a rather shallow article on Motley Fool Uk. Sell side wise, the stock is covered from 8 analysts, 5 buys, 3 holds, the more recent recommendations were buys. So not a totally uncovered stock but definitely not in the spotlight. The company is first and foremost a construction company. Additionally the provide “fit out” services for offices and “affordable housing” projects. A new business field is called urban regeneration. Nice business if you can get it, at least from a Working capital perspective. Where does that come from ? The average credit period on revenue is 15 days (2010: 23 days). No interest is charged on the trade receivables outstanding balance. Trade receivables overdue are provided for based on estimated irrecoverable amounts. The directors consider that the carrying amount of trade payables approximates to their fair value. The average credit period taken for trade purchases is 28 days (2010: 25 days). No interest was incurred on outstanding balances. So a “Quick and dirt” calculation tells us: Morgan Sindall gets paid 15-28 = -13 days earlier than they pay their bill. 13/365*2 bn = 80 mn EUR on average “net negative working capital”, so the year-end numbers above are somewhat higher than average. What I find even more amazing is the fact that property, plant and equipment is a mere 21 mn GBPs, the rest of the long term assets are Intangibles and special investments. Only 6 mn in property (freehold, financial lease) and 15 mn EUR in equipment. So my stupid question is: Where do they get all the machinery etc. from ? The answer seems to be simple. Outsorcing. For example to Speedy Hire Plc as this web site shows. Speedy Hire’s balance sheet is like the (bad) mirror image of Morgan Sindall: Lots of fixed assets, positive net working capital. Higher gross margins but very volatile. Operating cashflow looks better, mostly because of depreciation of the fixed assets. To me it seems that Morgan Sindall managed to pass on a lot of capital requirements and volatility onto its “partners” like Speedy hire. Despite being an UK construction company working on very thin margins, Morgan Sindall seems to have a very interesting business model. They run the firm as a whole on negative invested capital requirement (ex Goodwill) which is quite an achievement and seem to have outsourced a lot of volatility. Together with the other positive aspects mentioned above, this definitely is worth a deeper look into it and the UK construction sector. The main question is if the comapny is cheap enough to offer a “margin of safety”. In the third installment, after the French Top 25 and the German Top 25, lets look at the united Kingdom. In my current database, i have around 220 UK companies. This is of course only a part of the big UK stock universe, but I “filtered” out a lot of stocks even before putting them into my database. Steve Romick plays the “Renault stub” game among others. So to conclude my “Bouygues week”, a final post about the company. In my recent post about Bouygues, a commentator said if I can’t correctly project future profitability levels for the French mobile phone market, then investing into Bouygues is not a good idea. As I call myself a fundamental investor, I have to admit that I do not have any extra knowledge about the french mobile market at the moment.